Herein is described procedures implemented in the Caffrey Membrane Structural and Functional Biology Group to harvest and cryo-cool membrane protein crystals grown in lipidic cubic and sponge phases for use in structure determination using macromolecular X-ray crystallography. Li, D., Boland, C., Aragao, D., Walsh, K., Caffrey, M. Harvesting and Cryo-cooling Crystals of Membrane Proteins Grown in Lipidic Mesophases for Structure Determination by Macromolecular Crystallography. J. Vis. Exp. (67), e4001, doi:10.3791/4001 (2012). An important route to understanding how proteins function at a mechanistic level is to have the structure of the target protein available, ideally at atomic resolution. Presently, there is only one way to capture such information as applied to integral membrane proteins (Figure 1), and the complexes they form, and that method is macromolecular X-ray crystallography (MX). To do MX diffraction quality crystals are needed which, in the case of membrane proteins, do not form readily. A method for crystallizing membrane proteins that involves the use of lipidic mesophases, specifically the cubic and sponge phases1-5, has gained considerable attention of late due to the successes it has had in the G protein-coupled receptor field6-21 (www.mpdb.tcd.ie). However, the method, henceforth referred to as the in meso or lipidic cubic phase method, comes with its own technical challenges. These arise, in part, due to the generally viscous and sticky nature of the lipidic mesophase in which the crystals, which are often micro-crystals, grow. Manipulating crystals becomes difficult as a result and particularly so during harvesting22,23. Problems arise too at the step that precedes harvesting which requires that the glass sandwich plates in which the crystals grow (Figure 2)24,25 are opened to expose the mesophase bolus, and the crystals therein, for harvesting, cryo-cooling and eventual X-ray diffraction data collection. The cubic and sponge mesophase variants (Figure 3) from which crystals must be harvested have profoundly different rheologies4,26. The cubic phase is viscous and sticky akin to a thick toothpaste. By contrast, the sponge phase is more fluid with a distinct tendency to flow. Accordingly, different approaches for opening crystallization wells containing crystals growing in the cubic and the sponge phase are called for as indeed different methods are required for harvesting crystals from the two mesophase types. Protocols for doing just that have been refined and implemented in the Membrane Structural and Functional Biology (MS&FB) Group, and are described in detail in this JoVE article (Figure 4). Examples are given of situations where crystals are successfully harvested and cryo-cooled. We also provide examples of cases where problems arise that lead to the irretrievable loss of crystals and describe how these problems can be avoided. In this article the Viewer is provided with step-by-step instructions for opening glass sandwich crystallization wells, for harvesting and for cryo-cooling crystals of membrane proteins growing in cubic and in sponge phases. In preparation for harvesting, fill the dry foam Dewar with liquid nitrogen and place it beside the microscope where harvesting is to take place. Submerge the storage puck, open end up, in the liquid nitrogen inside the foam Dewar and allow it to fully cool. Secure a micro-mount of a size that matches the crystal to be harvested on a magnetic wand (Figure 5). It is important to have on hand a number of spare magnetic wands preloaded with micro-mounts to cater for situations where it is necessary to harvest several crystals from the one bolus. Spare wands should be available at all times. Place a micropipette, tips and the precipitant solution that was used for crystal growth next to the harvesting microscope. It may be needed to cover the mesophase and to prevent drying when the well is opened. Have a notebook and pen on the bench close by and/or the computer open. These will be used to record observations regarding the quality, appearance, location, storage puck number, etc., of crystals as they are harvested, cryo-cooled and placed in storage. If an assistant is available to help with harvesting that person must understand clearly the protocol that will be followed, the order in which the various steps will take place, and their role in the overall process. The simplest and most direct method for finding harvestable crystals is to inspect wells by hand using a microscope with normal and with crossed polarized light. Adjusting the illuminating light intensity on the microscope can help with locating crystals. Alternatively, an imager where plates are screened automatically with normal and crossed polarized light, can be used to look for crystals. Evaluate by eye recorded digital images on a computer monitor. Clearly mark those wells with crystals for harvesting and record comments on the size, quality and location of the crystals in the mesophase in the notebook or on a computer. Remove the plate containing crystals for harvesting from the imager. The plates in which crystals grow by the in meso method are glass sandwich plates (Figure 2). In order to access the mesophase and the crystals therein, it is necessary to open the well. This is done by using a glass cutting tool to cut the upper coverglass that seals the well which can then be removed. There are several approaches for cutting and removing the coverglass from over a crystallization well. The one to use is dictated by the type of mesophase in which the crystal is found growing. This can be the very viscous and sticky cubic phase (Figure 3A) or its more fluid variant, the sponge phase (Figure 3B). In this video article we show how to open wells and to harvest crystals from both of these hosting materials. Place the glass sandwich crystallization plate on the stage of a light microscope. Using a glass cutting tool score the coverglass lightly with two concentric circles situated above the spacer and just outside the perimeter of the well. With a new cutting tool, scoring requires minimal applied pressure. Replace the tool with a new one when the pressure required to score increases even fractionally; this typically occurs after opening 10 wells. Break up the glass in the space between the two scored circles for the purpose of releasing the inner coverglass. This generates lots of glass shards and dust. Clear them away with a moistened paper towel. Remove the freed coverglass by gripping it with a fine tipped tweezers and tilting it away from and off the well. In this case, the cubic phase remains stuck and in place on the baseplate of the well. Zoom in to get a clearer view of the cubic mesophase which is now ready for use in crystal harvesting. Using the glass cutting tool score straight parallel lines in the coverglass to one side of the well and that extend across the well itself. This enables easier tweezers access to and removal of the coverglass. In this particular demonstration, the coverglass cracks in freeing the coverglass from the sticky spacer surface. In the process, the coverglass shifts in position and the precipitant separates from the cubic phase. When the coverglass is lifted some of the precipitant goes with it. We are left with an exposed bolus of mesophase without any surrounding precipitant. Immediately, add 1 μl fresh precipitant on top of the bolus using a micropipette to prevent the mesophase from drying out and undergoing a phase change which may damage the crystals. The bolus is now ready to be used in crystal harvesting. The sponge phase is less forgiving to work with because of its ability to flow. If that flow results in the sponge phase contacting the perimeter of the well capillarity will draw out the mesophase and the crystals will be lost. An example of this happening is shown in this video clip. Zoom in on the sponge phase and switch back and forth between normal and crossed polarized light to locate crystals in the sponge phase. In preparation for opening the well score and cut the coverglass as described in Section 3. In the process, the coverglass cracks. In attempting to open the well the precipitant shifts in the direction of the crack and eventually it comes in contact with the spacer. With the precipitant goes some of the sponge phase and its cargo of crystals which are lost. In this particular sequence, the polarizers on the microscope are not completely crossed and the crystals can be seen as bright objects at the same time that the well and its contents remain visible. Zoom in on the sponge phase and identify a crystal both in normal and crossed polarized light. Score, cut and remove a section of coverglass covering the well, as in Section 4.1. Incompletely crossed polarized light is used to keep track of the crystal. Introduce a piece of dry tissue paper through the opening in the coverglass and into the well until it just touches the precipitant solution. Wick away the solution carefully until it is almost all gone and then remove the tissue. This causes the remaining precipitant and sponge phase, with the crystal still in place, to retract under the coverglass. Score, cut and remove with a tweezers the rest of the coverglass, as in Section 4.1. In this case, the sponge phase splits; some remains in the well and some sticks to the coverglass. The crystal is in the bolus on the coverglass. Because there is very little precipitant present, the sponge phase begins to undergo a phase transition likely due to drying out. This can be seen as a ring of birefringence that migrates toward the center of the bolus. Immediately add precipitant to the bolus to halt the transition. The bolus is now ready for use in crystal harvesting. Go back and forth between normal and crossed polarized light to locate crystals in the cubic phase bolus in the open well. In this video sequence up to four birefringent crystals can be seen in the cubic phase bolus with crossed polarized light. Use a mounted cryo-loop (Figure 5) to probe the freshly exposed mesophase for crystals, to fish out crystals and then to plunge them, contained in the cryo-loop, into liquid nitrogen in the Dewar immediately upon harvesting. Ideally, the harvesting and snap-cooling should happen in one continuous and rapid motion. As little adhering mesophase as possible should be harvested with the crystal. In our experience, cryo-protectant is not needed with in meso-grown crystals. Since it is not possible to look for the crystal in the cryo-loop immediately after harvesting inspect the mesophase bolus used for harvesting to verify that the crystal is no longer there suggesting that it was harvested successfully. Go back and forth between normal and crossed polarized light to locate crystals in the sponge phase bolus in the open well. In this video sequence many birefringent crystals can be seen in the bolus under crossed polarized light. Use a mounted cryo-loop (Figure 5) to fish out crystals from the sponge phase and to plunge them, contained in or on the cryoloop, into liquid nitrogen in the Dewar immediately upon harvesting. As with harvesting from the cubic phase, ideally, the cryo-cooling process should happen immediately the crystal is harvested with as little time as possible elapsing between the actual harvesting event and plunging into liquid nitrogen. As little adhering sponge phase as possible should be harvested with the crystal. As noted, cryo-protectant is not needed with in meso-grown crystals. Having plunged the mounted loop into liquid nitrogen place it in one of the holding slots of the storage puck in the foam Dewar. All manipulations are done with the loop, the top of the magnetic wand and the puck submerged in liquid nitrogen. Record the location and details of the harvested and cryo-cooled crystal in the notebook and/or on the computer. When the puck in the foam Dewar is full or harvesting for the day is completed transfer the puck into a shelved puck holder in a storage or a transport Dewar filled with liquid nitrogen. Crystals can be shipped in transport Dewars to the synchrotron facility for diffraction data collection. The objectives of the harvesting and cryo-cooling exercises demonstrated here are to transfer a crystal from the hosting mesophase into cryo-loops, to vitrify the looped crystal and to place it in storage in liquid nitrogen in a Dewar. The ideal situation is where harvesting and cryo-cooling are done in such a way that the diffraction quality of the crystal is preserved in the process. As little mesophase as possible should be harvested with the crystal. This is to make locating the crystal and centering it in the X-ray beam that much less challenging, to speed cryo-cooling with a view to vitrification, and to minimize interfering background scatter from the mesophase during diffraction data collection. Some examples of cryo-cooled samples where the crystal can and cannot be seen are shown in Figure 6. Where the crystal cannot be seen by eye it is usually necessary to resort to diffraction rastering in order to find the crystal and to center it in the beam for data collection27. Figure 1. 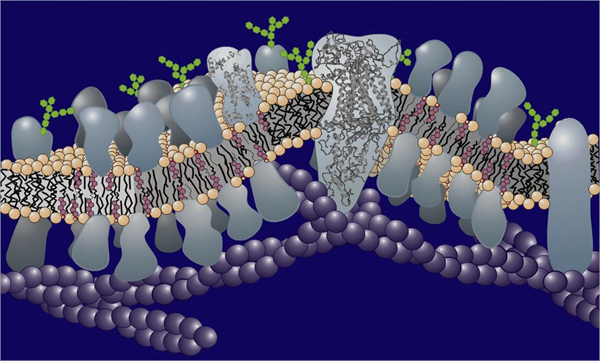 Schematic representation of a biological membrane showing the lipid bilayer in and on which are situated a variety of proteins. Figure 3. Crystals of membrane proteins growing in the lipidic mesophase. A. The cubic phase with a crystal of bacteriorhodopsin from H. halobium. B. The sponge phase containing a crystal of the vitamin B12 receptor/transporter, BtuB, from E. coli. From Reference 25. The cubic and sponge phases have contrasting appearances as is obvious by comparing panels A and B. The cubic phase in A is extremely viscous and retains its original shape. It does not flow. This is particularly apparent at the edges of the mesophase bolus that have a roughened appearance. By contract, the sponge phase is considerably less viscous and does flow. Thus, the sponge phase fails to retain its original shape and its edges are characteristically smooth. Precipitants that include Jeffamine, PEG 400, 2-methyl-2,4-pentandiol, pentaerythritol propoxylate, butanediol and hexanediol, can result in a transition from the cubic to the sponge phase4,26. Figure 4. The flowchart summarizes the steps involved in the production, harvesting and cryo-cooling of in meso-grown membrane protein crystals (A). Only those steps surrounded by the dashed red line, and described in detail in (B), are covered in this JoVE article. Panel A is from Reference 3. Click here to view larger figure. Figure 5. An empty cryo-loop mounted on a pin that is held in place on a magnetic wand. Expanded views of the pin (A) and micro-mount (B) of this important tool for harvesting and cryo-cooling are shown. The empty loop at the end of the micro-mount in B is 30 μm in diameter. While having not tested other loop types extensively, we find that the MiTeGen loops shown work well with both the cubic and sponge phases. Figure 6. Harvested and cryo-cooled crystals of membrane proteins in cryo-loops as viewed with an in-line microscope on a synchrotron beamline. A, B. Examples of harvested crystals (caa3 cytochrome oxidase34 (A), diacylglycerol kinase, DgkA (B)) where the crystals (blue arrow) are visible through the cryo-cooled mesophase on a cryo-loop. C. Example of where the harvested crystal is not visible in the cryo-cooled mesophase on a cryo-loop. The tip of the loop is identified with a red arrow. The adhering cryo-cooled mesophase is identified with a blue arrow. In this video article we demonstrated how crystals grown in a lipidic mesophase are harvested and cryo-cooled in preparation for use in diffraction data collection and ultimately for structure determination. The hosting mesophase can be the viscous and sticky cubic phase or the more fluid sponge phase4. How the glass sandwich plates are opened and how the crystals are harvested very much depends on mesophase type. It is important therefore to know which of the two one is dealing with ahead of time. The identity of the hosting lipid and the precipitant used are important in this regard, and the physical appearance of the mesophase bolus in the crystallization well can be used to tell them apart (Figure 3). Harvesting from both mesophase types was illustrated in this article. Harvesting small crystals from a lipidic mesophase in glass sandwich plates is a painstaking process that requires time, skill, experience, patience and a steady hand. It is important to set aside an appropriate amount of time for harvesting and to set up the laboratory so that all the supplies and equipment are at hand in advance. A second person to assist with harvesting is not essential but is recommended. That person can help with supplying pre-marked plates to the individual doing the harvesting as well as placing cryo-cooled mounted loops with harvested crystals into the storage puck. The assistant can also play an important support role in documenting observations on the crystals made during harvesting that might prove crucial during diffraction data collection. In the absence of an assistant, a voice-activated audio-recording device could be used to advantage for documentation. Following the protocol described in this article will help get the Viewer up and running with crystal harvesting. However, it is important to appreciate that the process is not straightforward and that practice is needed before launching into harvesting valuable membrane protein crystals. It is recommended therefore that test plates with crystals of proteins that are not particularly valuable be experimented with first. This will provide the neophyte with valuable experience in cutting glass, removing glass shards, lifting up the coverglass from over the mesophase, using the polarizing feature on the microscope to see crystals and to track them during harvesting, and finally handling the different types of mesophases and harvesting from them. The texture of the mesophase, and by extension the ease with which crystals can be harvested, does change with time during crystallization. It is important therefore to practice harvesting with less valuable crystals but with those that have grown under the same conditions as the more valuable ones. It is possible to grow crystals of lysozyme and thaumatin by the in meso or lipidic cubic phase method28 and these should be considered by way of gaining familiarity with the materials and the method. One should also consider working with protein-free mesophase first to learn of its vagaries. The procedures demonstrated here were all done at a comfortable 20 °C or thereabouts. It is possible to grow crystals by the in meso method at lower temperatures. Thus, monoolein as the hosting lipid in a metastable phase state can be used at 4 °C 1,2,29,30. An alternative is to use the rationally designed 7.9 MAG for low temperature crystallization31. We do low temperature crysallogenesis routinely with certain membrane protein targets. In this case, crystal growth and harvesting is done in a walk-in 4 °C refrigerator. Working under such conditions has its own challenges not the least of which is the need for warm and comfortable attire. The next step in the overall process of structure determination using macromolecular crystallography is to collect diffraction data on crystals harvested and snap-cooled as demonstrated in this article. In meso-grown crystals are usually small. However, useful diffraction data collection has been possible with crystals having a maximum dimension of 20 μm9. For this purpose, micro-beam synchrotron X-radiation is used and is the focus of a separate JoVE article in this series32,33. There are many who contributed to this work and most are from the Caffrey Membrane Structural and Functional Biology Group, both past and present members. To all, and especially to Jingquan Tan and Joseph Lyons, we extend our warmest thanks and appreciation. This work was supported in part by grants from Science Foundation Ireland (07/IN.1/B1836), the National Institutes of Health (GM75915, P50GM073210 and U54GM094599), and FP7 COST and Marie Curie Actions (CM0902 and PIEF-GA-2009-235612). Caffrey, M., Li, D., Dukkipati, A. Membrane protein structure determination using crystallography and lipidic mesophases - recent advances and successes. Biochemistry. Forthcoming (2012). Cherezov, V., Clogston, J., Papiz, M. Z., Caffrey, M. Room to move: crystallizing membrane proteins in swollen lipidic mesophases. J. Mol. Biol. 357, 1605-1618 (2006). Cherezov, V., Peddi, A., Muthusubramaniam, L., Zheng, Y. F., Caffrey, M. A robotic system for crystallizing membrane and soluble proteins in lipidic mesophases. Acta Crystallogr. D. 60, 1795-1807 (2004). Cherezov, V., Rosenbaum, D. M., Hanson, M. A., Rasmussen, S. G., Thian, F. S., Kobilka, T. S., Choi, H. J., Kuhn, P., Weis, W. I., Kobilka, B. K., Setvens, R. C. High-resolution crystal structure of an engineered human beta2-adrenergic G protein-coupled receptor. Science. 318, 1258-1265 (2007). Chien, E. Y., Liu, W., Zhao, Q., Katritch, V., Han, G. W., Hanson, M. A., Shi, L., Newman, A. H., Javitch, J. A., Cherezov, V., Stevens, R. C. Structure of the human dopamine D3 receptor in complex with a D2/D3 selective antagonist. Science. 330, 1091-1095 (2010). Granier, S., Manglik, A., Kruse, A. C., Kobilka, T. S., Thian, F. S., Weis, W. I., Kobilka, B. K. Structure of the delta-opioid receptor bound to naltrindole. Nature. 485, 400-404 (2012). Haga, K., Kruse, A. C., Asada, H., Yurugi-Kobayashi, T., Shiroishi, M., Zhang, C., Weis, W. I., Okada, T., Kobilka, B. K., Haga, T., Kobayashi, T. Structure of the human M2 muscarinic acetylcholine receptor bound to an antagonist. Nature. 482, 547-551 (2012). Hanson, M. A., Roth, B., Jo, E., Griffith, M. T., Scott, F. L., Reinhart, G., Desale, H., Clemons, B., Cahalan, S. M., Schuerer, S. C. Crystal structure of a lipid G protein-coupled receptor. Science. 335, 851-855 (2012). Jaakola, V. P., Griffith, M. T., Hanson, M. A., Cherezov, V., Chien, E. Y., Lane, J. R., Ijzerman, A. P., Stevens, R. C. The 2.6 angstrom crystal structure of a human A2A adenosine receptor bound to an antagonist. Science. 322, 1211-1217 (2008). Kruse, A. C., Hu, J., Pan, A. C., Arlow, D. H., Rosenbaum, D. M., Rosemond, E., Green, H. F., Liu, T., Chae, P. S., Dror, R. O. Structure and dynamics of the M3 muscarinic acetylcholine receptor. Nature. 482, 552-556 (2012). Manglik, A., Kruse, A. C., Kobilka, T. S., Thian, F. S., Mathiesen, J. M., Sunahara, R. K., Pardo, L., Weis, W. I., Kobilka, B. K., Granier, S. Crystal structure of the micro-opioid receptor bound to a morphinan antagonist. Nature. 485, 321-326 (2012). Rasmussen, S. G., Choi, H. J., Fung, J. J., Pardon, E., Casarosa, P., Chae, P. S., Devree, B. T., Rosenbaum, D. M., Thian, F. S., Kobilka, T. S., Schnapp, A., Konetzki, I., Sunahara, R. K., Gellman, S. H., Pautsch, A., Steyaert, J., Weis, W. I., Kobilka, B. K. Structure of a nanobody-stabilized active state of the beta(2) adrenoceptor. Nature. 469, 175-180 (2011). Rasmussen, S. G. F., Devree, B. T., Zou, Y., Kruse, A. C., Chung, K. Y., Kobilka, T. S., Thian, F. S., Chae, P. S., Pardon, E., Calinski, D. Crystal structure of the β2 adrenergic receptor-Gs protein complex. Nature. 477, 549-555 (2011). Rosenbaum, D. M., Cherezov, V., Hanson, M. A., Rasmussen, S. G., Thian, F. S., Kobilka, T. S., Choi, H. J., Yao, X. J., Weis, W. I., Stevens, R. C. GPCR engineering yields high-resolution structural insights into beta2-adrenergic receptor function. Science. 318, 1266-1273 (2007). Rosenbaum, D. M., Zhang, C., Lyons, J. A., Holl, R., Aragao, D., Arlow, D. H., Rasmussen, S. G., Choi, H. J., Devree, B. T. Structure and function of an irreversible agonist-beta(2) adrenoceptor complex. Nature. 469, 236-240 (2011). Shimamura, T., Shiroishi, M., Weyand, S., Tsujimoto, H., Winter, G., Katritch, V., Abagyan, R., Cherezov, V., Liu, W., Han, G. W., Kobayashi, T., Setvens, R. C., Iwata, S. Structure of the human histamine H1 receptor complex with doxepin. Nature. 475, 65-70 (2011). Thompson, A. A., Liu, W., Chun, E., Katritch, V., We, H., Vardy, E., Huang, X. P., Trapella, C., Guerrini, R., Calo, G., Roth, B. L., Cherezov, V., Stevens, R. C. Structure of the nociceptin/orphanin FQ receptor in complex with a peptide mimetic. Nature. 485, 395-399 (2012). Wu, B., Chien, E. Y., Mol, C. D., Fenalti, G., Liu, W., Katritch, V., Abagyan, R., Brooun, A., Wells, P., Bi, F. C., Hamel, D. J., Kuhn, P., Handel, T. M., Cherezov, V., Stevens, R. C. Structures of the CXCR4 Chemokine GPCR with Small-Molecule and Cyclic Peptide Antagonists. Science. 330, 1066-1071 (2010). Wu, H., Wacker, D., Mileni, M., Katritch, V., Han, G. W., Vardy, E., Liu, W., Thompson, A. A., Huang, X. P., Carroll, F. I. Structure of the human kappa-opioid receptor in complex with JDTic. Nature. 485, 327-332 (2012). Cherezov, V., Abola, E., Stevens, R. C. Recent progress in the structure determination of GPCRs, a membrane protein family with high potential as pharmaceutical targets. Methods Mol. Biol. 654, 141-168 (2010). Liu, W., Cherezov, V. Crystallization of membrane proteins in lipidic mesophases. J. Vis. Exp. (2011). Cherezov, V., Caffrey, M. Nano-volume plates with excellent optical properties for fast, inexpensive crystallization screening of membrane proteins. J. Appl. Cryst. 36, 1372-1377 (2003). Cherezov, V., Caffrey, M. Picolitre-scale crystallization of membrane proteins. J. Appl. Cryst. 39, 604-606 (2006). Wöhri, A. 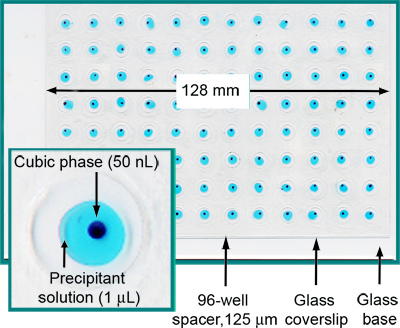 B., Johansson, L. C., Wadsten-Hindrichsen, P., Wahlgren, W. Y., Fischer, G., Horsefield, R., Katona, G., Nyblom, M., Oberg, F. A Lipidic-Sponge Phase Screen for Membrane Protein Crystallization. Structure. 16, 1003-1009 (2008). Cherezov, V. Rastering strategy for screening and centring of microcrystal samples of human membrane proteins with a sub-10 microm size X-ray synchrotron. 6, 587-597 (2009). Caffrey, M. A lipid's eye view of membrane protein crystallization in mesophases. Curr. Opin. Struct. Biol. 10, 486-497 (2000). Briggs, J., Chung, H., Caffrey, M. The temperature-composition phase diagram and mesophase structure characterization of the monoolein/water system. J. Phys. Ii. 6, 723-751 (1996). Qiu, H., Caffrey, M. The phase diagram of the monoolein/water system: metastability and equilibrium aspects. Biomaterials. 21, 223-234 (2000). Misquitta, Y., Cherezov, V., Havas, F., Patterson, S., Mohan, J. M., Wells, A. J., Hart, D. J., Caffrey, M. Rational design of lipid for membrane protein crystallization. J. Struct. Biol. 148, 169-175 (2004). Caffrey, M., Porter, C. Crystallizing Membrane Proteins for Structure Determination using Lipidic Mesophases. J. Vis. Exp. e1712 (2010). Li, D., Boland, C., Walsh, K., Caffrey, M. Use of a robot for high-throughput crystallization of membrane proteins in lipidic mesophase. J. Vis. Exp. e4000 (2012). Lyons, J. A., Aragao, D., Slattery, O., Pisliakov, A. V., Soulimane, T., Caffrey, M. Structure insights into electron transfer in caa(3)-type cytochrome oxidase. Nature. 10, (2012).